It's time to get going on those Christmas cards and Mona Pendleton's new set, MPD Starry Christmas is filled with beautiful images and sentiments to get you started. 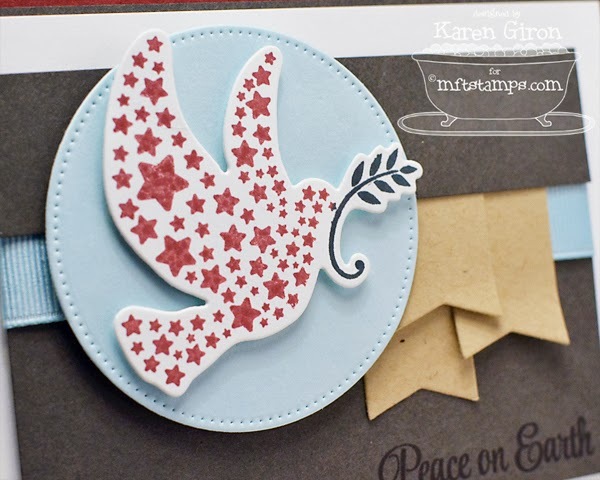 I cut out the dove from MPD Starry Christmas Die-namics in Smooth White Card Stock and then stamped the image in Paver Red and Timber Green Ink. I popped it up over a Pierced Circle STAX Die-namics and then decorated the panel underneath with Sno Cone Ribbon and 3 Jumbo Fishtail Banner STAX Die-namics. I added the sentiment along the bottom of the Steel Grey panel in Black Licorice Ink. The layout here is Jen Shults' DS117. I kept the inside of the card very simple and added a sentiment in Paver Red Ink. Wow! So pretty! I love the colors! And the banners! This is just beautiful Karen!! Love this Karen! The peaceful dove and pop of color with your banners are just beautiful. Great card, I love the added banners. Love how you layered everything on this card! So pretty Karen! Love all the layers! This is gorgeous Karen! 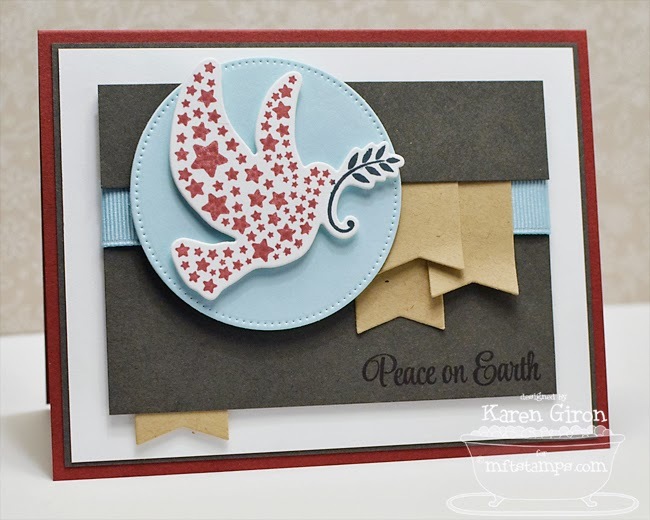 I love all the grey cardstock with the blue, red and kraft... that's a lovely color scheme! :) Hugs!! Great holiday card. The new Starry Chrstmas set is fantastic. Great design and color combo, Karen! LOVE the placement of the fishtails! 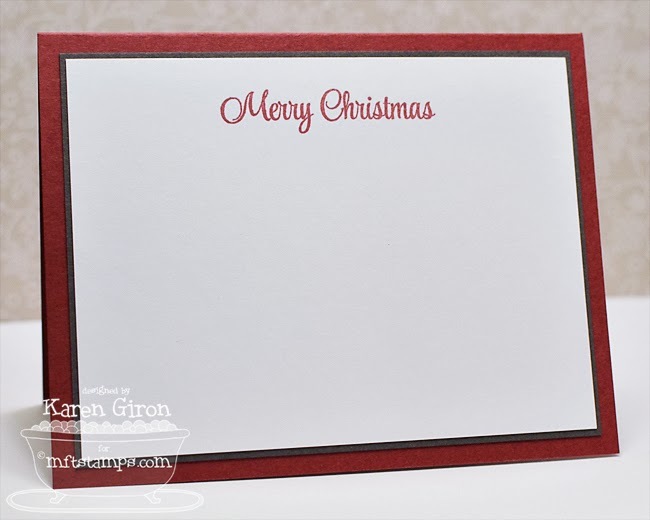 Just ordered some MFT cardstock with my winnings and really love it ... such an awesome card. Beautiful card! I love the color combo and flags. Love your colors and design, Karen! Such a Scandinavian color scheme. Love it. Beautiful card. Love the color palette. Great card - loving all the layers and your color combo used. love the curled banners placed just so. So very pretty Karen inside and out! Love the design, very pretty! Such a Nice & Beautiful Card! Great Job!